Transitionally designed to complement both soft contemporary and traditional faucet designs, the InSinkErator Involve View Instant Hot Water Dispenser is the perfect addition to your kitchen. So simple and useful, once you use it, you will love it instantly. The Involve View instant hot water system includes an elegant Satin Nickel finish hot water faucet and a 750-watt, 2/3-gallon stainless steel tank that delivers near-boiling water. An easy-adjustable thermostat allows you to control the temperature from 160 degrees F to 210 degrees F. The integrated hot lever features a convenient instant self-closing valve that automatically shuts off to ensure safe use. The Involve View hot water dispenser seamlessly mounts on the edge of your kitchen sink and is designed for do-it-yourself installation, with no special plumbing required. Convenient tool-free tank connections and dry-start protection provide easy set-up and peace of mind. The system requires an unswitched AC power outlet, dedicated control valve with compression fitting, and T-fitting. The faucet requires a standard 1-1/4-inch to 1-1/2-inch diameter hole for installation with a maximum counter thickness of 3 inches. InSinkErator covers the Involve View instant hot water dispensers with an exclusive 3-Year We Come to You In-Home Full Service Limited Warranty. This warranty includes free house calls (including parts and labor) for the entire warranty period. Exclusive 3-Year We Come to You In-Home Full Service Limited Warranty; That means we come to you if your water dispenser needs service within the warranty period. The InSinkErator HOT150 Instant Hot Water Dispenser System is the newest and most affordable addition to the Invite series. So simple and useful, once you use it, you will love it instantly. The HOT150 instant hot water dispenser features a modern Satin Nickel finish hot water faucet and 750-watt, 2/3-gallon stainless steel tank that delivers near-boiling water. An easy-adjustable thermostat allows you to control the temperature from 160 degrees F to 210 degrees F.
The HOT150 system is designed for do-it-yourself installation, with no special plumbing required. Convenient tool-free tank connections and dry-start protection provide easy set-up and peace of mind. The system requires an unswitched AC power outlet, dedicated control valve with compression fitting, and T-fitting. The faucet requires a standard 1-1/4-inch to 1-1/2-inch diameter hole for installation with a maximum counter thickness of 2 inches. 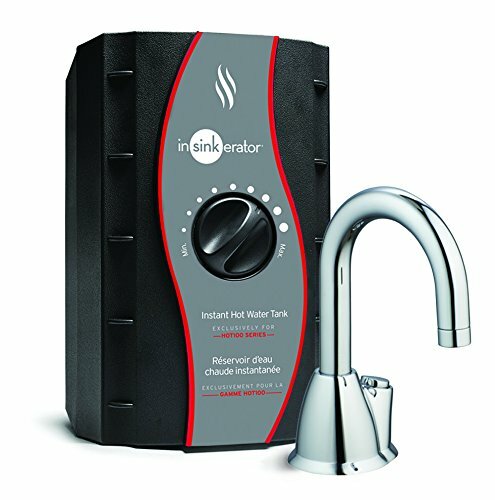 InSinkErator covers the HOT150 instant hot water dispensers with an exclusive 1-Year We Come to You In-Home Full Service Limited Warranty. This warranty includes free house calls (including parts and labor) for the entire warranty period. Exclusive 1-Year We Come to You In-Home Full Service Limited Warranty; That means we come to you if your water dispenser needs service within the warranty period. 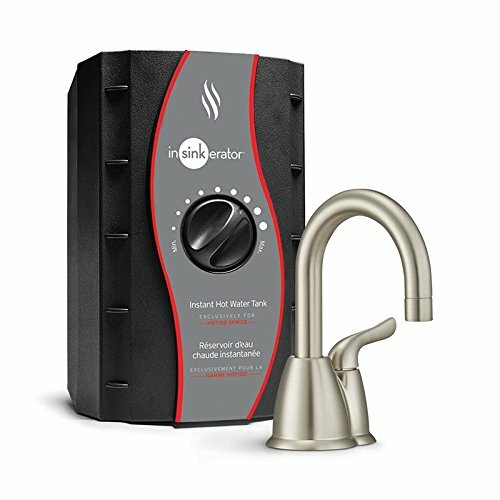 The InSinkErator HOT100 Instant Hot Water Dispenser System is the newest and most affordable addition to the Invite series. So simple and useful, once you use it, you will love it instantly. 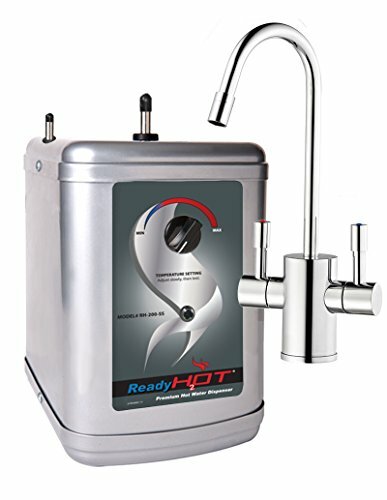 The HOT100 instant hot water dispenser features a modern Chrome finish hot water faucet with easy push-button and 750-watt, 2/3-gallon stainless steel tank that delivers near-boiling water. An easy-adjustable thermostat allows you to control the temperature from 160 degrees F to 210 degrees F.
The HOT100 system is designed for do-it-yourself installation, with no special plumbing required. Convenient tool-free tank connections and dry-start protection provide easy set-up and peace of mind. The system requires an unswitched AC power outlet, dedicated control valve with compression fitting, and T-fitting. The faucet requires a standard 1-1/4-inch to 1-1/2-inch diameter hole for installation with a maximum counter thickness of 2 inches. 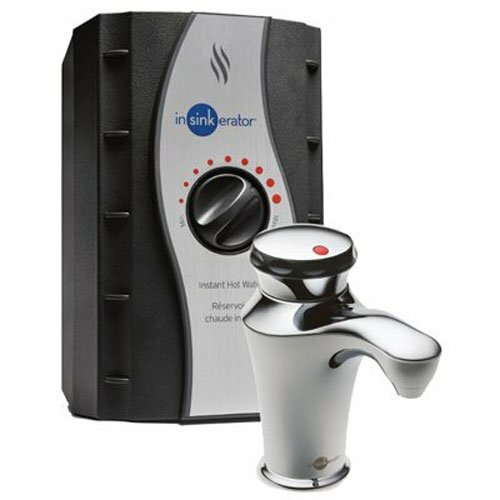 InSinkErator covers the HOT100 instant hot water dispensers with an exclusive 1-Year We Come to You In-Home Full Service Limited Warranty. This warranty includes free house calls (including parts and labor) for the entire warranty period. For years, the only solutions to hot water were stove-top or microwave heating. 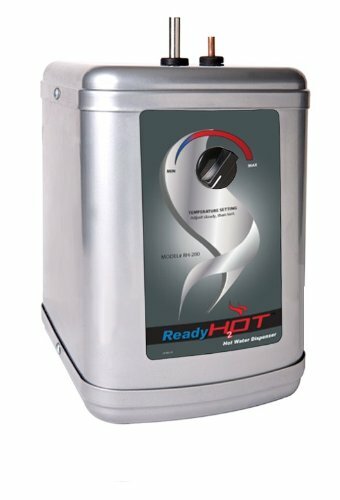 Now, the Ready Hot instant hot water tank can deliver 190 degree water at your fingertips with no waste, use only what you need. 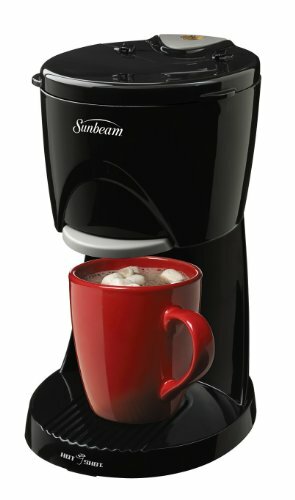 The near-boiling water makes beverage and instant foods in seconds including tea, coffee, cocoa, soups, noodles, pasta, and vegetables. In addition, it may be used for many other household tasks like warming baby food & bottles or cleaning pots & pans. 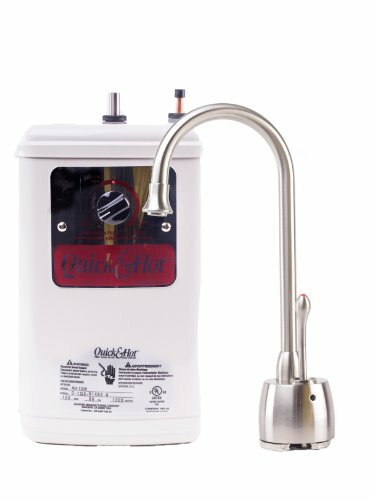 The HOT150 instant hot water dispenser features a modern Chrome finish hot water faucet and 750-watt, 2/3-gallon stainless steel tank that delivers near-boiling water. An easy-adjustable thermostat allows you to control the temperature from 160 degrees F to 210 degrees F.
An exquisite blend of modern and traditional faucet designs, the InSinkErator Involve Wave Instant Hot Water Dispenser is the perfect addition to your kitchen. So simple and useful, once you use it, you will love it instantly. The Involve Wave instant hot water system includes an elegant Chrome finish hot water faucet and a 750-watt, 2/3-gallon stainless steel tank that delivers near-boiling water. An easy-adjustable thermostat allows you to control the temperature from 160 degrees F to 210 degrees F. The integrated hot lever features a convenient instant self-closing valve that automatically shuts off to ensure safe use. The Involve Wave hot water dispenser seamlessly mounts on the edge of your kitchen sink and is designed for do-it-yourself installation, with no special plumbing required. Convenient tool-free tank connections and dry-start protection provide easy set-up and peace of mind. The system requires an unswitched AC power outlet, dedicated control valve with compression fitting, and T-fitting. The faucet requires a standard 1-1/4-inch to 1-1/2-inch diameter hole for installation with a maximum counter thickness of 3 inches. InSinkErator covers the Involve Wave instant hot water dispensers with an exclusive 3-Year We Come to You In-Home Full Service Limited Warranty. This warranty includes free house calls (including parts and labor) for the entire warranty period. 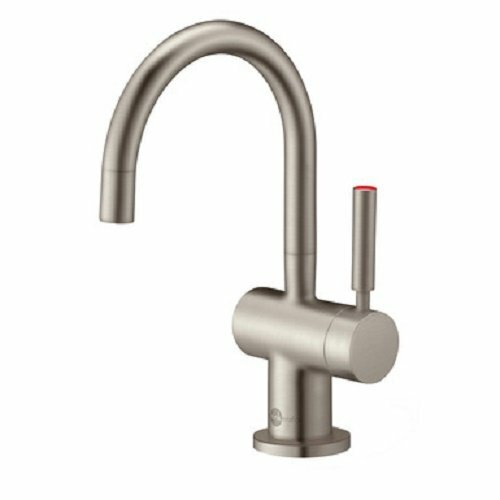 The InSinkErator Indulge Modern F-H3300 Instant Hot Water Dispenser Faucet in Satin Nickel offers stunning clean lines, blending efficiency and style to coordinate with today s finest kitchens. It's always ready to dispense near-boiling water at your command. The Indulge Modern instant hot water faucet features a sleek, swivel spout and unique single-handle design which provide a minimalistic look. Its solid brass construction offers unrivaled quality for durability and corrosion resistance. The hot lever features a convenient instant self-closing valve that automatically shuts off to ensure safe use. The InSinkErator Indulge Modern instant hot water tap is available in Chrome and Satin Nickel finishes to perfectly complement your kitchen. It's ideal for instantly preparing gourmet coffee and hot tea, steaming vegetables in a flash, warming baby bottles in seconds, removing candle wax from candle holders, cleaning without the use of harsh chemicals, removing stubborn lids and labels, and so much more. 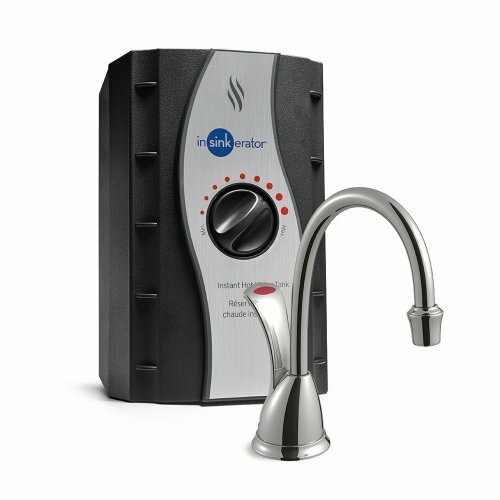 The Indulge Modern instant hot water faucet is to be used in combination with the InSinkErator HWT-F1000S Hot Water Tank and Filtration System (sold separately) for filtered near-boiling water right when you need it. The faucet requires a standard 1-3/8-inch to 1-1/2-inch diameter hole for installation with a maximum counter thickness of 3 inches. 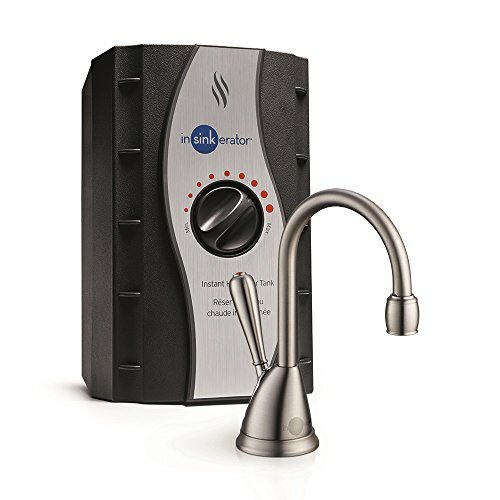 InSinkErator covers the Indulge Modern instant hot water faucet with an exclusive 5-Year We Come to You In-Home Full Service Limited Warranty. This warranty includes free house calls (including parts and labor) for the entire warranty period. Exclusive 5-Year We Come to You In-Home Full Service Limited Warranty; That means we come to you if your water dispenser needs service within the warranty period. For years, the only solutions to hot water were stove-top or microwave heating. Now, the Ready Hot instant hot water tank can deliver 190 degree water at your fingertips with no waste, use only what you need. The near-boiling water makes beverage and instant foods in seconds including tea, coffee, cocoa, soups, noodles, pasta, and vegetables. In addition, it may be used for many other household tasks like warming baby food and bottles or cleaning pots and pans. 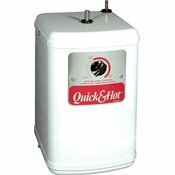 Instant hot water dispenser 1300-Watt hot water tank and Coronado Collection faucet included. Part number H711-U-SN is a combo unit which includes both hot water tank and satin finish faucet (AH-1300-C-hot water tank & H711-SN-satin finish hot water faucet). near-boiling water (view larger). Add the convenience of instant hot water to your kitchen with the Waste King H711-U-SN hot water dispenser kit, which includes a 1300-watt hot water tank and elegantly curved Coronado faucet in satin nickel. You'll have near-boiling water at your fingertips (up to 190 degrees F) to help you prepare instant drinks like tea and hot chocolate, instant soups, and more. No need to wait for the water to boil, no water waste, and no mess. 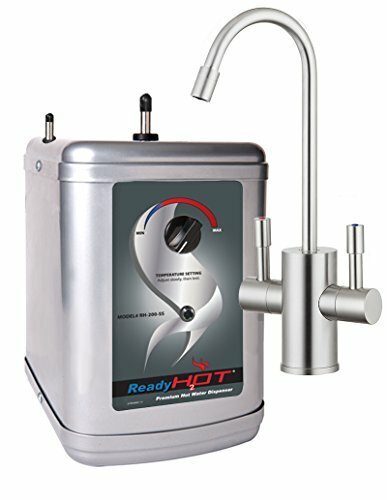 The H711-U-SN hot water dispenser offers fingertip adjustment, enabling you to switch the water temperature from 140 degrees F to a near-boiling 190 degrees F. The 1300-watt heating element provides a fast recovery time, and the large 5/8-gallon reservoir delivers a generous 100 cups-per-hour capacity. It's also highly energy efficient, using less electricity than a 40-watt light bulb and typically costing you less than $2 per month to use. The insulated stainless steel tank is not under pressure, and the self-contained expansion chamber reduces dripping. The easy-to-install Quick-Connect fittings and improved connections reduce probability of kinked or twisted water lines. The dispenser comes installed with a power cord, and it's backed by a 1-year replacement warranty. Includes a safety feature that allows increases and decreases in temperature without risking over-expansion of the bladder. This may cause the faucet to drip from time to time, because of the open vented safety system. Tired of lifting heavy water jugs or hand pumping water? Why Not Try Yatuela portable electric bottle water pumps? Makes your life easy and healthy! 1. It is recommended to replace or deeply clean the water pipe 6-12 months. 2. Make sure your water bottle's mouth size around 55-58mm. 3. Please charge it for 3-4 hours with regular mobile USB charger adapter at first time using it. 4. The status indicator lamp on in charging, automatic off when it is full charged. High Compatibility : Useful-Electric pumping device fits for all 1,2,3,4,5,6 gallon bottles having cap diameters between 55-60mm. With a 8.26-inch (20.98cm) neck. No Installation, no remodeling, no need to drill holes and no need to erect stands. Safety & Health : Made with premium quality materials which are 100% BPA-free&FDA approved. High density ABS plastic, 304 stainless steel faucet and food-grade silicone hose. NO any Unpleasant Smells and easy to clean! Confidently drink for your family necessary healthy water! USB Rechargeable Battery : Built in UL Certified 1500mAh lithium-ion battery and included USB charging cable, The 2-3 hours fast charge function will make sure can be used for 20-25 days or around 5-8 bottles of 5 gallon water once full charged. No need to charge every day. Large function, extremely practical. 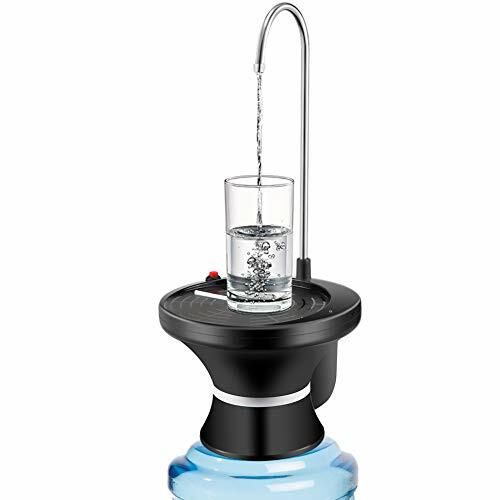 Easy To USE : Just fix, insert and tighten the tube into the bottled water, then press to get start to dispense. 2 available switches ,easy to manually maneuver at the press of a simple button, the weight of your cup activates the another switch and removing it will make the dispenser automatically stop. 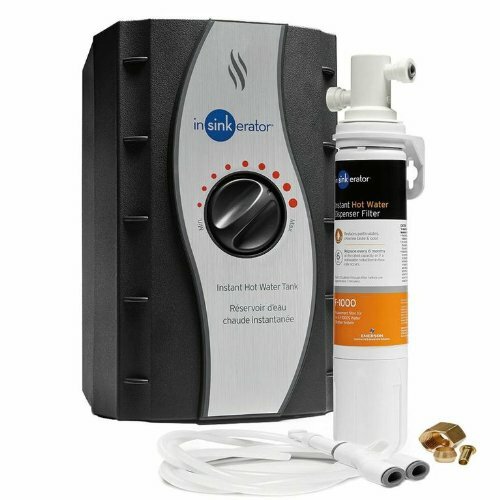 Extensive Usage : Easy to install and fast flowing, easy to carry, Whether you're using this electric water dispenser in the comfort of your own home, at the office, in a public space, hotel, during a picnic or camping activity, you'll always have fresh water at your disposal both indoors and outdoors!